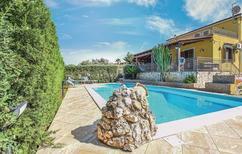 Villa with pool for six people near Trapani. ​Sicily | It can get pretty hot under the Sicilian sun. Those who have a pool right next to the holiday home terrace, which they can call their own while on holiday, are at a clear advantage. 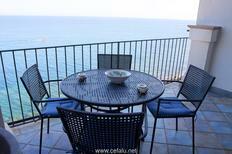 Apartment for four people in Castellammare del Golfo. Sicily | The heavenly beauty of sunrises and sunsets awaits you - as these holiday homes and apartments offer a direct view of the Mediterranean. Pantelleria | You can spend your holiday in a typical dammuso on the little island of Pantelleria near Sicily. This is a rustic stone lodge, half-built into the rock. This holiday home for up to four people can be found in the immediate vicinity of the sea, near Taormina on Sicily's east coast. Sicily | Summer temperatures already prevail on Sicily in spring. Nothing can stand in the way of some bathing fun when you have a holiday home near the beach. ​Aeolian Islands | The “Isole Lipari” lie in the Tyrrhenian Sea, north of Sicily. Spend a great island holiday on Stromboli, Vulcano and co. in a secluded location surrounded by unique countryside. 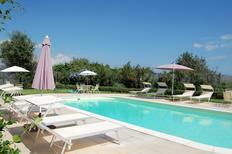 Country estate for 15 people in a beautiful location in the Val d’Orcia. ​Tuscany | Whether a restored farm house or agriturismo – during a country vacation in Tuscany you can experience the nature and regional cuisine. Apartment for two people in the beautiful district of Trastevere. 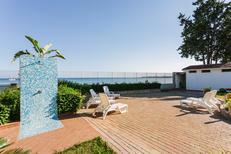 Holiday park at Gallipoli, directly by the sea. Italy | A vacation in a holiday park is particularly ideal for families. As parents you can lean back and relax whilst your kids are taken care of your hands and are fully entertained. 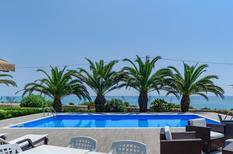 A holiday house on Sicily costs on average USD 516 in the cheap travel period and USD 1,447 in the peak season per week. These details are of course in relation to the house and not per person as well as includes the obligatory additional charges. Guests staying at holiday homes in Sicily often soon discover that the place is not only big in terms of size, but also in cultural and natural treasures. The largest of the Mediterranean islands, this Italian island abounds in everything that an ideal vacation is made of. Historic sites such as Baroque palazzos and Greek temples dot the landscape, creating a stunning contrast with the diverse terrain that has volcanic craters, dramatic mountains, and a spectacular coastline. Sicily has something of interest for every visitor – be it couples, large families, or travellers with pets. As visiting everything in Sicily is not possible in just one visit, you'll have all the more reason to keep revisiting this versatile island to discover newer pleasures every time. Staying at holiday homes in Sicily is a wonderful idea, and TUI Villas is just the right place to book them, considering the sheer variety and excellent service offered to customers. Roam around the island’s capital, Palermo, for a glimpse into the region’s history. There are remnants of diverse architectural styles all over the city, such as the Palatine Chapel and its beautiful Byzantine mosaics, and the Royal Palace of Palermo, showcasing Arab-Norman architecture. Visit the Regional Archaeological Museum Antonio Salinas, also in Palermo, which houses some valuable Greek and Roman artefacts as well as other items related to Sicily’s history. Head to the market of Syracuse on the island of Ortigia, where farmers from the neighbouring countryside sell fresh organic products, sometimes singing traditional songs in a bid to sell their wares. Ricotta and Ragusano, two local kinds of cheese, are popular items here. Make a trip to Southern Italy from your holiday apartment in Sicily to spend time at the popular Amalfi Coast, where the sea, surrounding cliffs, and picturesque villages come together to create postcard-like scenery. Check out Naples, also in the region, to relish pizza, visit museums, and walk around the historic centre. Sicily is home to Mount Etna, the largest active volcano in Europe. Get up close to the 3,300m peak on one of the many tours available. In winter, you can also ski on the volcanic slopes. The Modica Chocolate Museum, a hidden gem, wows adults and children alike. The delicious smell of chocolate wafts through the museum, where various chocolate sculptures are displayed and visitors can learn about the production process and the history of chocolate in the region. In addition, there are plenty of nature reserves where families and travellers with pets can take part in outdoor activities. 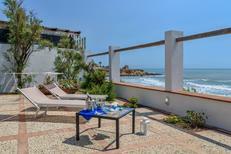 Alternatively, rent a holiday home by the sea and enjoy the gorgeous beaches for a true tropical island-style vacation. 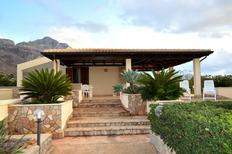 Why book a holiday home in Sicily? In a place like Sicily, where there is constantly something to do and see, coming back to a welcoming accommodation at the end of the day is something all travellers wish for. At TUI Villas, this is exactly what is offered. With the large selection of quality choices available, finding a holiday apartment in Sicily that takes care of your specific needs is a breeze. Whether you're looking for a romantic cottage, a pet-friendly apartment, or a large home with a pool for your entire family, you can expect trustworthy landlords and a safe booking process with TUI Villas. No Italian vacation would be complete without indulging in some of the yummy pasta available all over the island. Seafood is also popular owing to Sicily’s location, and desserts are an all-time favourite here. Granita, cannoli, and cassata are some popular sweet treats to try in Sicily. Arancini, a type of fried rice ball, is a popular fast food to try during your vacation. Better yet, pick up fresh produce from a market and try your hand at this local cuisine in the comfort of your own holiday home in Sicily. Whereas staying at a holiday home on an island is an exciting affair, Sicily offers more than most island vacations. Due to its location in the heart of the Mediterranean Sea, the island has other small but interesting islands close by that make ideal destinations when you're in the area. With its mud baths, hot springs, and stunning views, Lipari, the largest of the Aeolian Islands, draws plenty of visitors from May through September. There's also a 17th-century cathedral and a 16th-century castle to explore. A picturesque hilltop town located near Mount Etna, Taormina not only offers remarkable views but is also home to ancient sites such as a Greco-Roman theatre and a beach accessible by cable car. The second largest of the Aeolian Islands, Salina is best known for its dessert wine, Malvasia. It's also home to Mt. Fossa delle Felci, the highest point in the region and a favourite among hikers. Catania and Palermo airports welcome most flights coming into Sicily. Around 1,900 km apart, there are flights between London and Sicily every day. The journey takes about 3 hours with a direct flight. When you have arrived, a hired car is the most convenient way to get around. This lets you explore the island at your own pace - one adventure at the time. Summers tend to be rather long and hot on the island. Although temperatures get particularly high in the peak summer months of July and August, the coastal breeze helps a bit in some areas. Winters are short, but temperatures drop considerably from mid-December to early March. The best months to visit Sicily are from April to June and September through October, as the weather is mild and crowds are smaller. These times are also perfect for beach visits, hiking and sightseeing.